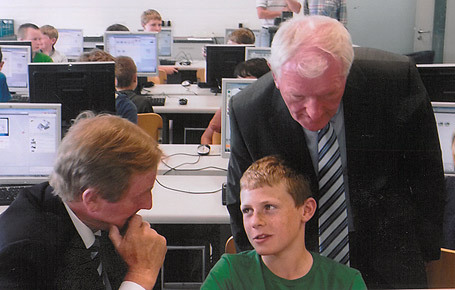 Following the accolade as the only Irish winner of the Google RISE Award, the activity camps organised by the Centre for Lifelong Learning received further recognition with a visit by An Taoiseach Mr Enda Kenny, TD on Monday 15th July. An Taoiseach visited the College to celebrate the 60th Anniversary of St Angela’s and as part of the occasion he took time in the schedule to visit a group of children attending the Robotics and Mobile App Camp. Forty children between the ages of 8 and 15 were participating in the camps on the day of the visit. “Children get hands on experience of design, electronics and programing to build a fully functioning robot,” explains Dr Niamh Plunkett, Director of the Centre for Lifelong Learning, "An Taoiseach and the other public representatives who visited the camp seemed very impressed by the enthusiasm of the young people in engaging with technology.” She added that the robotics camps, one of a number of activity camps, will see up to 200 children on campus during the summer. She also acknowledged the work by the ICT Department at the College, including Mr Brendan White, who bring their expertise to develop, design and deliver the camp content. An Taoiseach in his official address immediately following his visit to the Robotic Camp made direct reference to the innovative nature of the camps in getting young people interested in science, technology and engineering at a young age. The Centre for Lifelong Learning organises a series of activity camps, including the very popular Alternative Summer Camp which focuses on life learning skills such as baking, learning to start a heart, forensics, botanical fun, felt-making, economics made fun, life as a paramedic, sports, and Kodu which enables children build a game for their Xbox or PC. One day camps are also organised for young people with an intellectual disability along with Mid-term and Easter Break camps organised on campus, all with courtesy bus service from Sligo town. “The visit from An Taoiseach is a great boost for the camps and with the ongoing success and recognition of our activity camps we hope to expand the offerings over the coming years,” Dr Plunkett adds. Following the successful visit from An Taoiseach, representatives from Google Ireland will visit the activity camps on the 22nd of July. 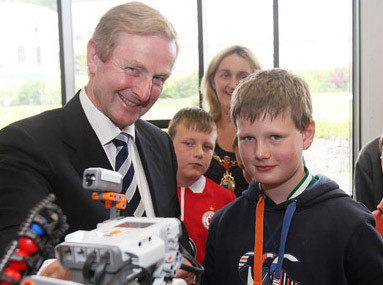 Main Photo: An Taoiseach and Tony McLoughlin TD meets a participant in the Robotics and Mobile App camp. Additional Photo: An Taoiseach meets Anthony Christopher from County Tyrone, a participant in the Robotics and Mobile App camp.